As this might be of interest to other drivers, I’ve moved it here from the defunct October 2011 blog. We did it! And we arrived safely in Yucatan. Here’s the tale, along with some helpful how-to’s. As first-time snowbirds, Mary and I wanted to drive to Merida, Yucatan, Mexico, as it would afford us the ability to bring more luggage than we could fly with, while also giving us the ability to do some roving after arriving. Friends thought we were insane. Understandable, considering media reports. The media has brainwashed the American public into thinking there is warfare going on across the entire Mexican nation. Yes, the many lives lost to the cartel violence cannot be diminished. But actually, it’s very isolated, and mostly out of sight. However, when visible, it is intentionally horrific. And ‘horrific’ attracts the media, which results in plenty of chatter but little in the way of change of recreational drug consumption in the north which drives the violence. This is sad, because gringo demand for illegal drugs is funding the executions which have occurred. Sad, because Americans love “freedom” to “do their own thing” while disregarding the grizzly consequences of their actions. Sad that they don’t recognize the inevitable destabilization of their own communities that is coming as a result of funding monstrous thugs with huge amounts of cash. But that’s not the story I’m here to tell. 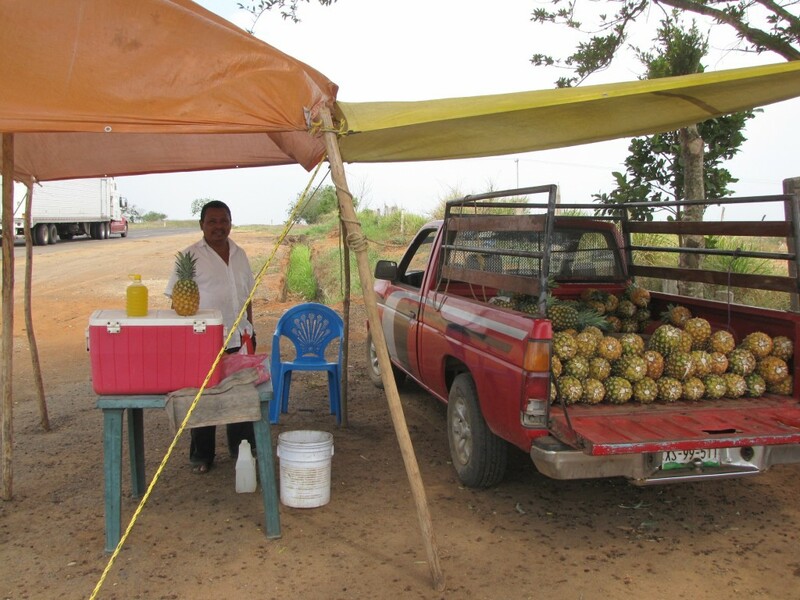 This blogpost is about driving safely thru eastern Mexico. 2. DONT DRIVE AFTER DARK. 3. Avoid downtowns where possible. 4. Use expressway tollroads (“cuotas”) when available. 5. Select the best routes. We left Buffalo NY at 10am on a Thursday and arrived in Merida, Yucatan, (on that bulbous peninsula, far south in the Gulf of Mexico, pointing back towards Miami) about 4:30pm the following Thursday. The Beatles said it well: “Eight Days a Week.” And, yes, it seemed like forever — surely the longest drive of our life. 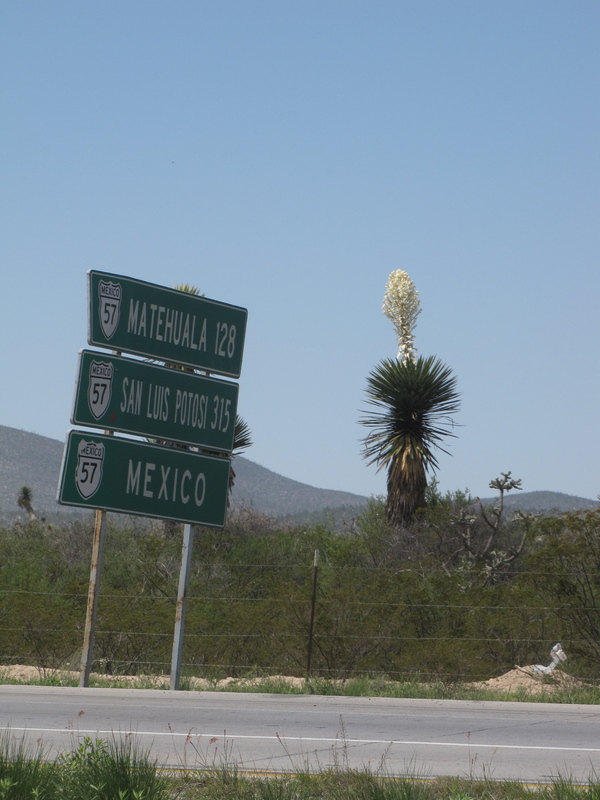 But driving thru Mexico was beautiful. The people are gracious and welcoming, and they are so warm and helpful. Travel has it stresses. I suspect most are self-created. Driving thru the states was uneventful. (There was beauty, grace, warmth and welcome there, too.) 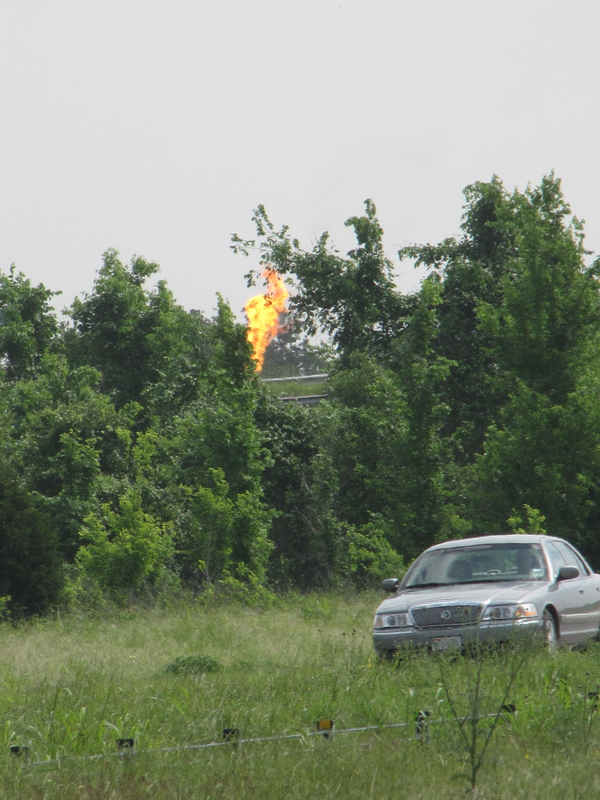 But it got a little crazy immediately south of San Antonio TX on Sunday afternoon. That’s where construction was narrowing three lanes down to one, causing what felt like 20 miles of stall and crawl traffic. And we compounded the conditions by not running our air conditioner. Neither of us discussed the issue in the car at the time; but I imagine that we both felt we were fleeing the frosty north, so we should embrace the hot south. Big mistake. We arrived in Laredo TX utterly fried by a hot sun glaring onto us, amplified by our windshield. Mary sat in the car while I checked into the motel. The clerk gave me a plastic key, but when I got to the room, I couldn’t find it, although I did remember the room number. So, I supposed he hadn’t given me a key, and went back to ask for one. Although he seemed surprised at my return, he didn’t assert that he had already given me a key; instead, he simply made up a new electronic key, instantly, with a digital access code. (In retrospect, we should have run the mental replay on this event carefully.) After dropping our luggage in the room we went for a swim and then walked to a nearby taco joint. That’s when I discovered I had no wallet. We ate quickly and came back to search for the wallet. Nada. I asked the clerk if I had left it with him. He looked nervous. And I felt bad for even asking, feeling stupid for losing track of such a valuable item. We did search at length, without results, and then called the credit card companies to cancel my cards. Friends from Toronto who have been driving this route for several years shared their observations gleaned over many transits. (Thanks Douglas and Kerry!) They suggested we cross at Columbia Bridge, (a well-marked exit off Rt 35 / Rt 81 which connects Rt 255 with the new bridge) bypassing Laredo about 20 miles north of the Texas border, routing traffic west of Laredo TX. 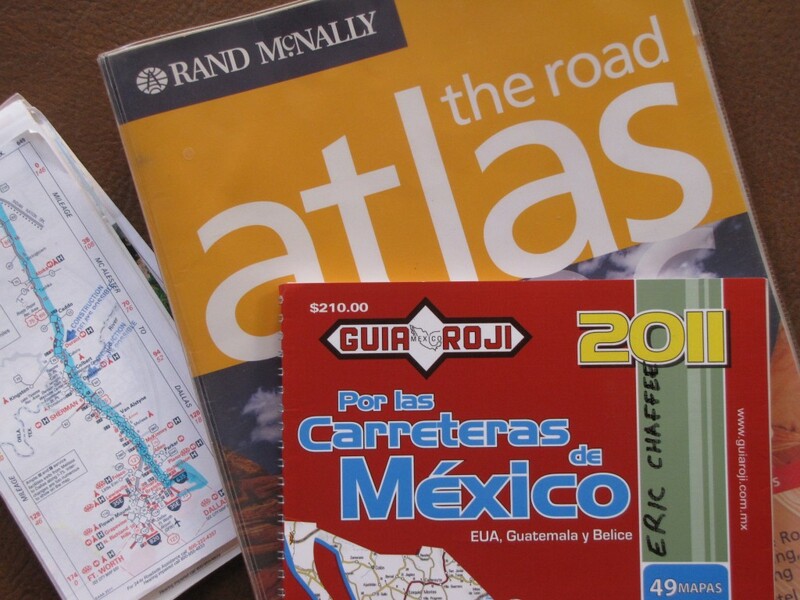 VERY ODDLY, this crossing is not marked at all on our brand new AAA TripTik, or on the 2011 Guia Roji, but it does show on Rand McNally’s 2006 Road Atlas of US, Canada, Mexico; however, Rand doesn’t have adequate detail in Mexico. Guia Roji is essential. And AAA doesn’t do TripTiks for Mexico. I’ve drawn the Columbia bridge crossing into Mexico in yellow highlighter (see photo), which is TX Route 255, off of 35 / 81. 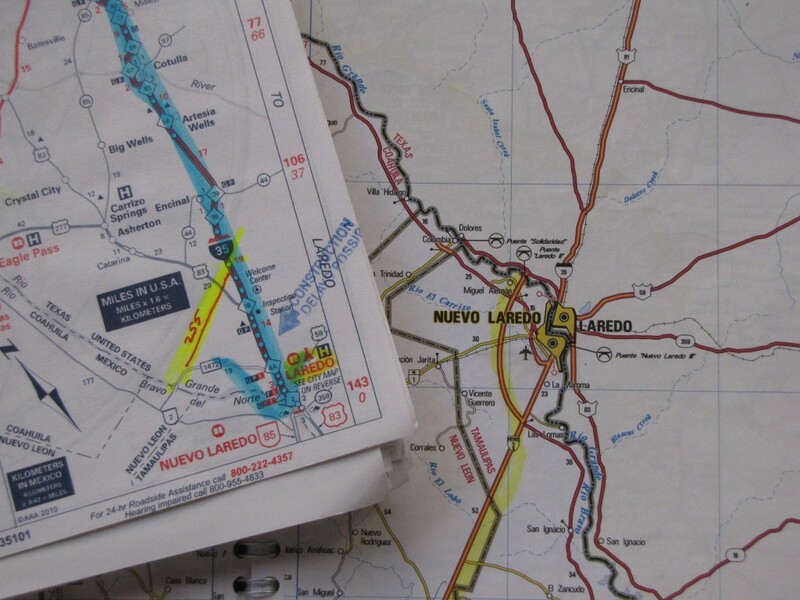 As we had stayed overnight in Laredo, we took TX Rt 1472 (Mines Road, also named Farm to Market Road) from our motel in Laredo to the Columbia Bridge crossing. That route connects with Rt 255 near the bridge, and is well marked. Yes, the Columbia Bridge traffic was exceedingly light. Our actual vehicle inspection was minimal, probably randomized; the inspector didn’t ask us to open anything inside our vehicle, merely opening the door of our van briefly. Ahead of us there were owners of five vehicles presenting documents at the registration window. But it took forever to get our visas and windshield sticker, as there was only one pretty-but-icy clerk on duty to process the permits, speaking only Spanish. We were already prepared with simple xerox copies of our documents, made at home: passport, vehicle title and registration, main page of our Mexican insurance policy bought online. (US insurance is not recognized in Mexico.) However, we still each had to buy a copy of our new visa, obtained only moments prior. And the cost of copying is high: about $1 per head, per page. We had some friendly chats with other gringos waiting on line. And then bumped into several of them hundreds of miles down the road. Yeah, small world; but delightful. NOTE: if a vehicle is jointly owned, either owner may pay the cost of the sticker with a credit card. But that individual’s visa number and credit card number will then follow the vehicle legally — which is to say there may be some complications upon exiting the country when the vehicle’s visa is surrendered, especially if the individual had to fly out briefly, and then later attempts to exit with a new personal visa number that doesn’t match the one on the vehicle, likely causing trouble and delay. (Mexico vigorously guards against you selling your car or leaving it behind.) And if there is trouble, the bond that was posted to guarantee removal of the vehicle from Mexico is at risk. Payment of the bond in cash might be a better option, as it then would not be associated with either owner, but rather with both. And charges additional to the bond could accrue against a card, but not against cash after seizure! Flexibility and minimalism are assets when wrestling with bureaucracy. Conclusion: we wish we could have paid cash, but we were holding it while our credit card issues got resolved. So Mary’s card is at risk. We hope she doesn’t need to fly home before we return in late March. FAST FORWARD TO THE RETURN TRIP in March 2012. Road food along the way was very tasty. But how much piña juice do you want to drink while driving. Without a cooler, it got fizzy pretty quick.